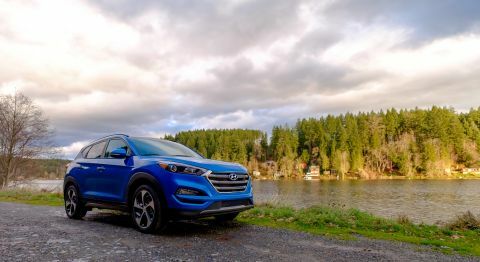 If it didn't have the Hyundai badge, it would be easy to mistake the Tuscon for a luxury crossover that would fit in with Audi and Lexus's lot, but it falls short on technology. Update: Review and score updated to reflect the recent software update that adds Android Auto and Apple CarPlay to the Tucson with navigation. I dig the Tucson's new look: the front-end has a mean grin to it, though it's not too aggressive. The car has an understated look that is more typical of luxury cars than the mainstream ones it competes with. Hyundai also reserved the use of chrome to some parts of the grille and door handles, which I appreciate deeply – I despise chrome accents on cars. You move your knee around a little and notice there's a padded vinyl cover for your right knee. Most of the interior of the Tucson looks luxe – until you reach for the center console. It's understandable to use cheaper plastics on the lower parts of the dash, but the transition from a nicely-appointed, padded knee rest to the cheapest plastic of the interior doesn't match well in my eyes. When Hyundai announced Display Audio and demonstrated development boxes at CES, there was a focus on Android Auto and CarPlay connectivity. The 2016 Tucson received Android Auto and Apple CarPlay support via software update in May. The implementation in the Tucson is the same as the 2017 Elantra and works just as well, just plug in your iOS or Android smartphone and follow the prompts. Hyundai lets you use the native navigation and Android Auto or Apple CarPlay seamlessly, so you can choose whichever interface you prefer.